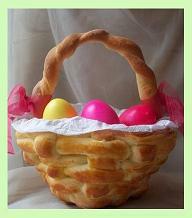 This page features creative, unconventional Easter Basket Ideas, and also provides links to other Easter holiday items. Traditional Easter symbols are of two types. Commercial Easter symbols include eggs, chicks, bunnies, and various flowers. Religious images associated with this holiday include crosses, goblets, doves, lilies, and stained glass windows. Traditional Easter color schemes involve white and yellow, as well as pastel colors such as pale blue, pale green, and pink. 1) The basket itself is part of the gift, so make it work! *** For a cooking enthusiast (or anyone who just loves food), make a batch of dough and fashion a bread basket like the one shown below. 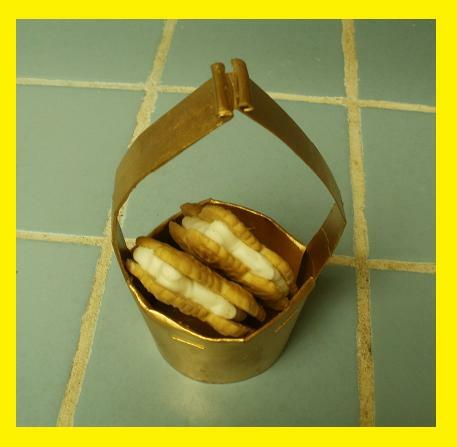 *** It's also easy to make a mini Easter basket from a recycled Starbucks coffee cup (as shown above with Maple Leaf cookies inside). 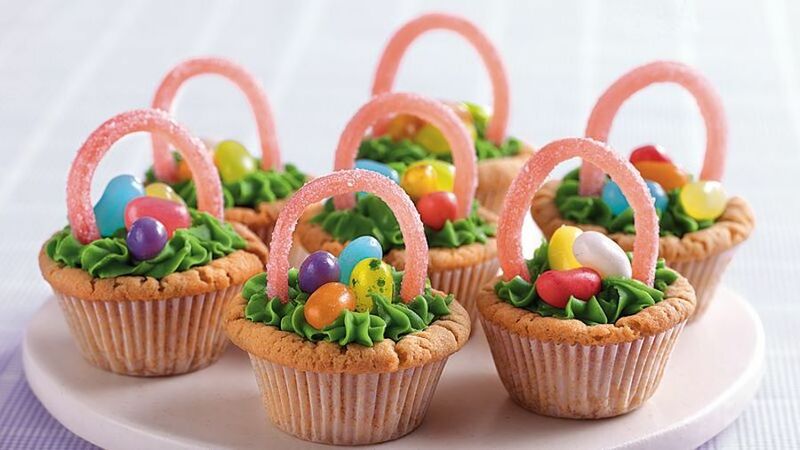 2) To line an Easter basket, use fresh grasses, bark, pretty weeds, wild flowers, or other organic materials, instead of the usual shredded green cellophane. A writer might appreciate cool stationery, post-it note pads, and colored pens or pencils. For a gardener, fill the basket with seed packets and bulbs, or maybe a potted plant. What sports enthusiast could possibly resist a basket full of sports memorabilia (lined with Astro turf, perhaps? ), maybe even containing coveted tickets to a local event? For children, fill the basket with cute, small inexpensive items like trading cards, stickers, temporary tattoos, key chains and other trinkets. Click any of the links below for more Easter ideas including baskets, coloring pages, and free printable Easter images. Make your favorite cupcakes, and top them with green icing, or (if you prefer) shredded coconut colored green, to represent grass. For the handle, use any long, bendable candy treat, such as red licorice sticks. Stick one end into each side of the cupcake. Adorn with jelly beans to represent eggs. 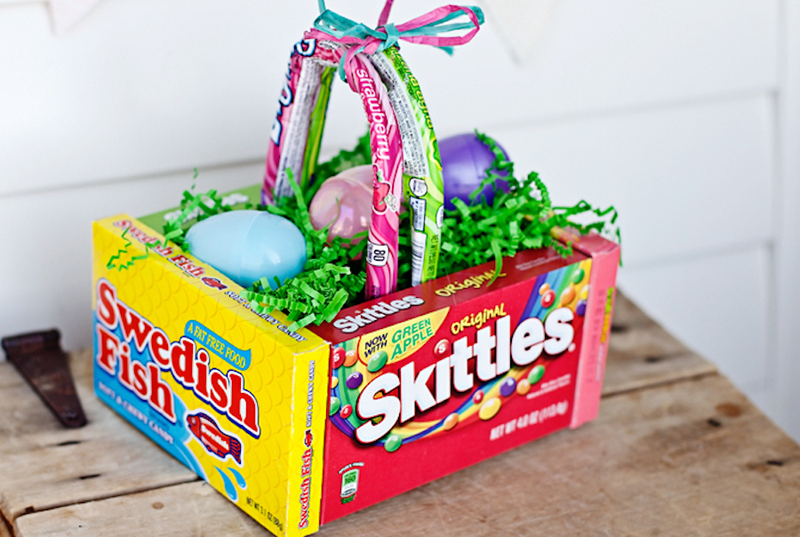 Construct your easter basket by gluing together boxes of Easter candy, as shown above. Use Pixie Stix for the handle of the basket. Tape the Pixie Stix to the inside of the basket. Fill the basket with the same types of candies it is made from. EASTER This page provides free printable coloring images with an Easter theme. Print and color Easter eggs, Easter bunnies and various religious symbols.